In 2017 INDEX-6 Ltd continued its successful introduction of equipment for the filling of heathy dairy products in small single use packages with aluminum foil sealing. A new line has been placed in operation in the factory of Gorky town, Belarus. 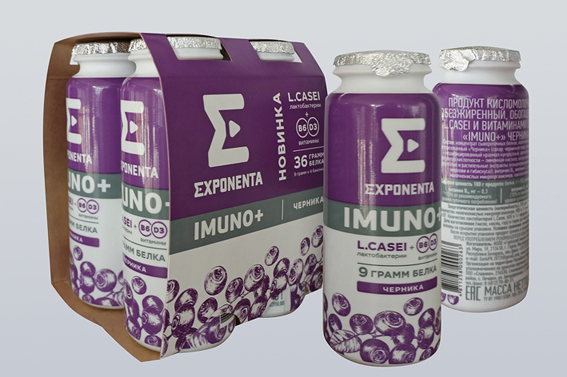 It is used for the filling of dairy products with the trade mark Exponenta Imuno+, which are a new generation of probiotic products, enhanced/ supplemented with complete whey proteins of high nutritious value and coming in three fresh fruity flavors –blueberry, strawberry and cherry with ginseng. In the heart of the filling line there is an ASSET CLEAN 43FFS 12/8/2 bloc consisting of a section for bottle sterilization, a section for high accuracy flowmetric filling and a closing section with two columns – one for sealing of the aluminum foil and one for applying a screw cap. Bottles come with а closed dome neck for high hygiene and are being produced on the spot. The unscrambler feeds them to the IND-Trans HV vacuum conveyer to be transported to the filling block 43 FFS 12/8/2. Right before they are positioned in the bloc, bottles pass through a RS70 trimmer for the cutting off of the dome and then enter in for sterilization, filling and sealing. The products of Exponenta Imuno+ are bottled in 100ml ergonomic containers, labeled by IND-Lab 38 with full heat-shrinkable label and packed in a commercial four-pack cluster carton (box).